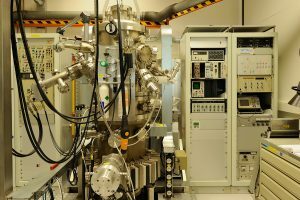 Electron Beam Physical Vapor Deposition or EBPVD is a form of physical vapor deposition in which a target anode is bombarded with an electron beam under high vacuum. The electron beam causes atoms from the target to transform into the gaseous phase. These atoms then precipitate into solid form, coating everything in the vacuum chamber (within line of sight) with a thin layer of the anode material.